This is a web design proposal for a real estate company somewhere in Kota Kinabalu. 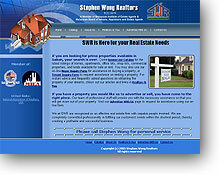 It contains a database-driven property listing, with administrative capabilities to update the list. The site uses ASP and MS Access. The site was already in third base (i.e. ready for deployment) when the company decided to develop the site in-house.